Lemon Bay Glass (LBG) follows specific techniques suggested by the Glass Association of North America (GANA). By following these methods we ensure a quality installation and product. The following are various publications providing the latest available information to glass dealers, distributors and installers on the procedures recommended by the Mirror Division of the Glass Association of North America (GANA) for proper storage, handling, fabrication, shipping, installation, and cleaning of high quality mirror products. These procedures help in preserving the integrity and prolonging the life of mirrors. 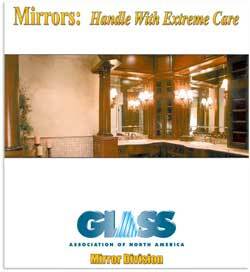 > Follow link to read Mirrors: Handle with Extreme Care brochure from GANA. > Link here to read on care of frameless shower enclosure. > Cleaning and Maintenance Guide for Architecturally Finished Alluminum from the AAMA.